This self guided cycling tour starts from La Rochelle and follows the Velodyssey, elected best cycling route in 2017! Ride in the Charente Maritime and discover many islands such as the island of Ré, the island of Aix, but also long sandy beaches, marshes, oyster basins ... Your bike trip then continues in the Médoc, a famous wine area, along the Atlantic Ocean! You will then ride through the most beautiful seaside resorts of Aquitaine: Soulac-sur-Mer, Montalivet-les-Bains, Hourtin, Carcans ... to reach the salty meadows, ports typical of the Bay of Arcachon basin! You will be warmly welcomed every night in 3 and 4 star hotels and charming bed and breakfast. Arrive at your 4-star hotel in La Rochelle, where you will find the road book and bikes waiting for you. “La Rochelle” is a touristic and lively city, remarkable for its history.The old harbor and its imposing twin towers which protected the entrance from13th century to 15th century. You can also enjoy the city centre and its arches as well as the town hall from the 15h century. Loop tour to the island of “Ré”, passing through the villages of “Flotte en Ré” (dating from the 18th century) and its fishing boats, “Saint- Martin” with its fortifications and its fortress. You will walk along the oyster beds, salt marshes and the nature reserve of the “illeau Niges”. Back by “La Couarde” and “Bois plage”. Today’s ride takes you along the coast and through the lively cities of “Chatelaillon” and “Fouras”. Your itinerary then continues by the nature reserve of the Yve’s Bay. In Fouras, you can choose to take the ferry to the Island Aix and visit this small island which welcomed the last pension of Napoleon 1st. 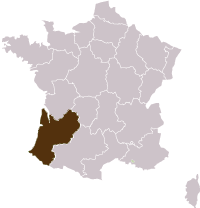 Before you arrive in “Marennes” the track takes you through “Rochefort”. This city founded in the 17th century around shipbuilding shares with you the original and unique transporter bridge “Eiffel”. The route continues on the bike paths of the most beautiful coast of Western France. You itinerary takes you on the cycle path through the pine forest of the “Palmyre” famous for its zoo. You will ride into “Royan” via “Saint Palais”, the beaches of “Vaux sur Mer”, “Pontaillac”, and the marina.This stage exhales the smell of maritime pines. Royan is a modern resort, rebuilt after WW2, that hides some beautiful villas of time, a modern Church, an original covered market and a festive and lively waterfront. 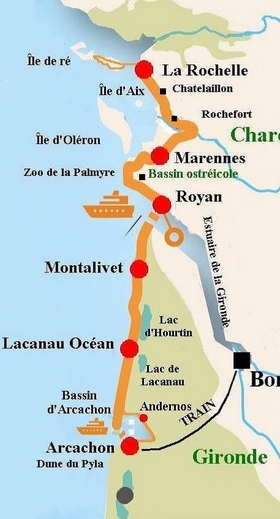 From Royan you will cross the estuary by boat with your bike and join the Medoc coast! From the tip of the Verdon you cycle on pleasant bike pathways and reach the charming seaside resort of Soulac.Enjoy the beaches and the Ocean as far as the eye can see.Wrapped in the smell of the pinewoods you continue up to Montalivet, a small peaceful sea side resort between the Landes forest, the Ocean and marshes. Depending on the availability of accommodation, you can make a stopover at Vendayes or Hourtin. Your trip continuse to Lacanau Ocean! Here the Velodyssey follows a cycle track through the pines, between the lakes and always the Ocean. Take a break in Hourtin, where lies the largest lake in France. « Lacanau-Ocean » in the Médoc Ocean region, where cycling is a way of life, is much appreciated for its long ocean beaches sheltered by dunes and forests. The seaside resort is also a famous surfing spot. The early 20th century villas witness of a rich past. Departure from Arcachon after breakfast. Transfer of the luggage every day. Starts in : La Rochelle - Easy acces to La Rochelle with the TGV from Paris.